Lancaster’s 24 Hour Recycling Center is located at at the Lancaster Maintenance Yard at 615 West Avenue H.
LANCASTER – The city of Lancaster’s 24 Hour Recycling Center will host a free “Spring Cleaning” Electronic Waste and Used Oil Recycling event on Saturday and Sunday, April 13 and 14, from 8 a.m. to 4 p.m. This event is open to all Antelope Valley residents and there is no limit to the amount of used motor oil or electronic waste attendees can bring. City staff will be available to assist each vehicle with the removal of used oil and unwanted e-waste items. For those who are unable to make it to the event, the City’s Recycling Center is open 24 hours a day, with an after-hours drop off location for weekends and holidays. The center also includes used oil and oil filter collection areas, separate pouring and container disposal stations, and segregated bins for electronic waste and batteries. For more information, visit www.cityoflancasterca.org/24-hr-recycling or call 661-723-5885. 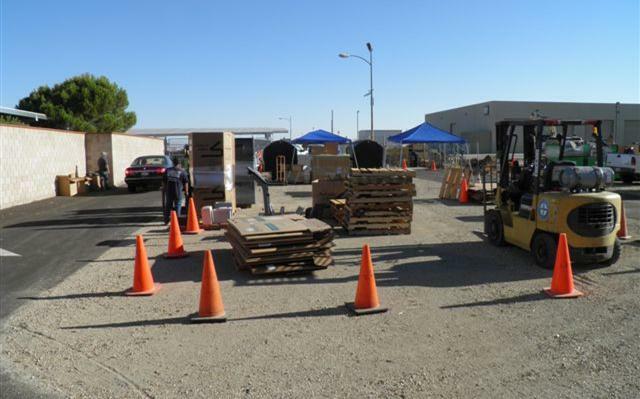 As part of Los Angeles County’s efforts to reduce illegal dumping, unincorporated area residents can drop off up to one ton of trash, free of charge, at Waste Management of Lancaster on Saturday, April 13, 2013, from 8 a.m. to 12 p.m. Waste Management of Lancaster is located at 600 East Avenue F in Lancaster. With proof of residency, such as a driver’s license, residents can drop off their trash from 8 a.m. to 12 p.m. Please note that the vehicles must be in the line by 12 p.m.
Free Dump Days are held twice a year, in April and October. Free Bulky Item Drop-off: Residents can drop off one bulky item per year, such as a sofa, table, mattress, etc., free of charge. Free Waste Tire Drop-off: Residents can drop off a total of four waste tires per year, free of charge. The programs are brought to residents by Supervisor Michael D. Antonovich and the County of Los Angeles in partnership with Waste Management, Inc.
For more information, call 888-CLEAN LA or visit www.cleanla.com.